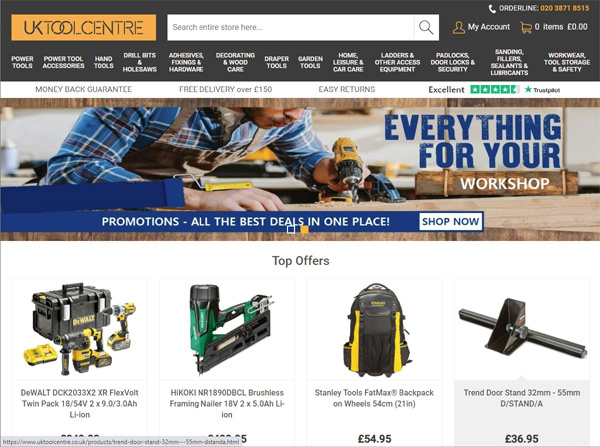 UK Tool Centre are stockists of a huge range of power tools and hand tools for both home DIY use and the trade professional. As well as offering fantastic deals and highly comptitive prices, they pride themselves on their commitment to excellent service. As well as power tools and hand tools from all the major brands such as Dewalt, Stanley, Bosch, Hitachi, Ryobi & more we also stock a range of decorating supplies (paints, woodfillers, oils & varnishes), fixings (such as rawbolts), accessories (drill bits, screwdriver bits, multi tool accessories), workwear, storage (toolboxes, toolbags and cabinets) and safety equipment. E2E worked closely with UK Tool Centre during the initial development and since the site was launched, UK Tool Centre's product range and customer base have evolved tremendously. E2E's creativity and development skills have helped realise UK Tool Centre's ideas and achieve their objectives. 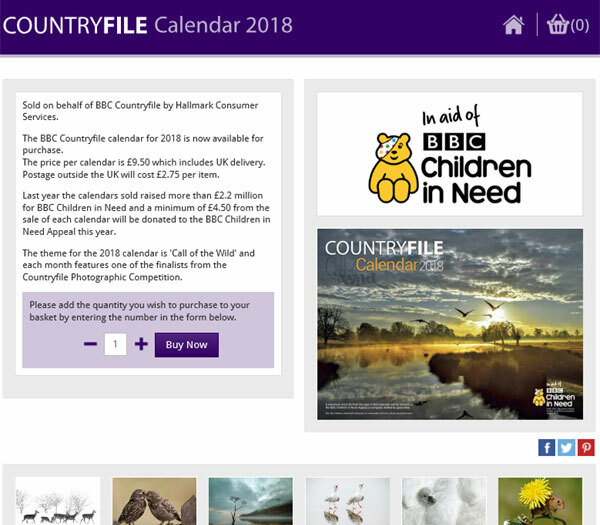 For the past 5 years E2E Solutions have worked with Hallmark Consumer Services to deliver the online ordering website for the BBC Country File Calendar. When the calendar is launched the website processes 3 orders per second during peak times, our platform processes payments and then passes orders directly into HMCS's order progressing system for fulfilment. E2E Solutions are responsible for the Responsive Design on the Ecommerce website, payment integration and full integration in the order processing system. UK Water Features is a friendly Yorkshire based company specialising in indoor & outdoor garden water features with a great complimentary selection of garden products. They sell both to the public, and to trade supplying landscape designers and gardeners throughout the UK. 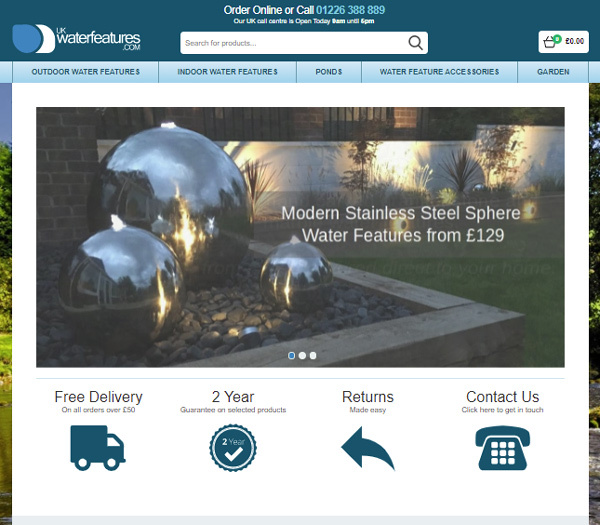 UK Water Features was started by two young entrepreneurs who were fed up with the lengthy delivery times, lack of choice and poor service offered by garden centres and online garden websites and set off to do something about it by contacting E2E Solutions! Originally launched in 2008 ukwaterfeatures.com has been with E2E from the start and continue to add both front-end and back-end upgrades to their already successful online business. FireStar Toys are passionate about bringing you a fantastic range of creative and educational toys from around the world. They also specialise in hard to find, rare and collectable toys. On their site you'll find a huge selection of LEGO mini-figures, accessories and custom weapons and parts exclusive to FireStar Toys. They're working with some of the most talented custom creators and artists on the web in order to offer the most covetable custom mini-figs, weapons and armour. The Firestar Toys website was an enjoyable and unique project for E2E Solutions. 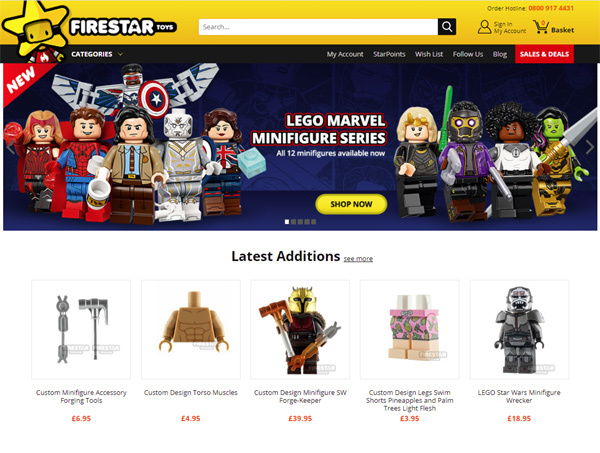 LEGO mini figures is a niche market with high traffic and sales figures meaning the site had to inspire the user, use effective navigation and encourage conversion. UK GEAR, founded in 1993, now has it's headquarters and customer services at the Wolsten Priory, Warwickshire, England. It also has an international office in California, USA. The company is recognised as a leading manufacturer of high performance athletic footwear and has built up a powerful reputation by pioneering increased durability in advanced sporting products. 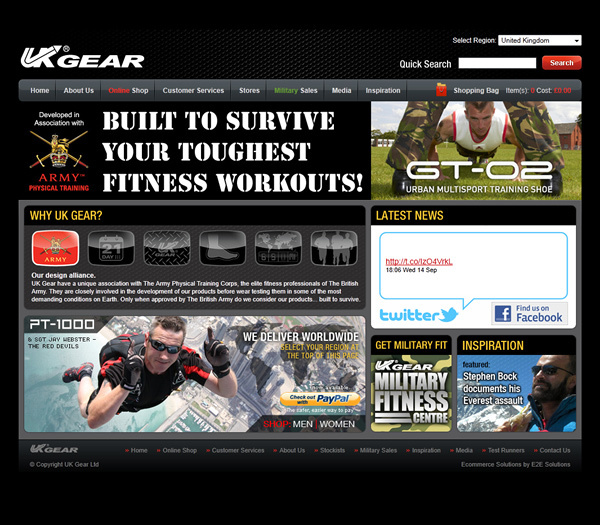 UK GEAR as a privately owned British company, remains devoted to a core set of guiding principles that sets the bench mark for the detailed quality and technical superiority of the products marketed under its brand name, its manufacturing integrity, and its unswerving commitment to complete customer satisfaction. 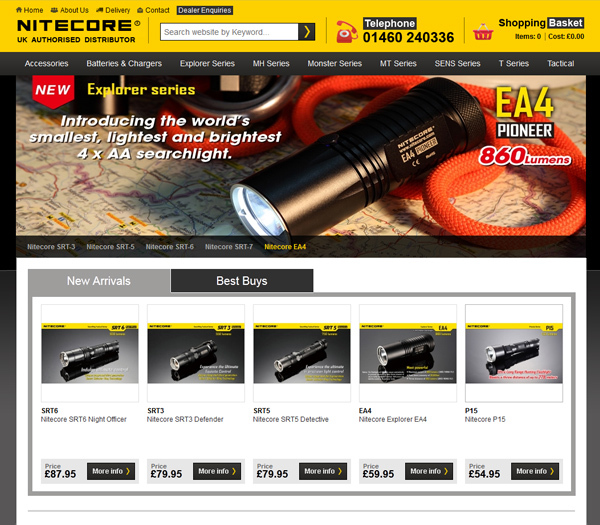 UK GEAR approached E2E to produce a new eCommerce system that not only bettered the design and usability of the current website; but would compete on a international level offering fine advanced sporting products online for all. Children's Party Shop aims to be the top UK online shop for children's partyware, boy's and girl's themed parties. They sell all your children's favourite televison characters and film party products including tableware (napkins, tablecovers, cups and plates) Party Bags (sweets and toys) balloons, party invitations, 'Happy Birthday' banners, party decorations and much more. 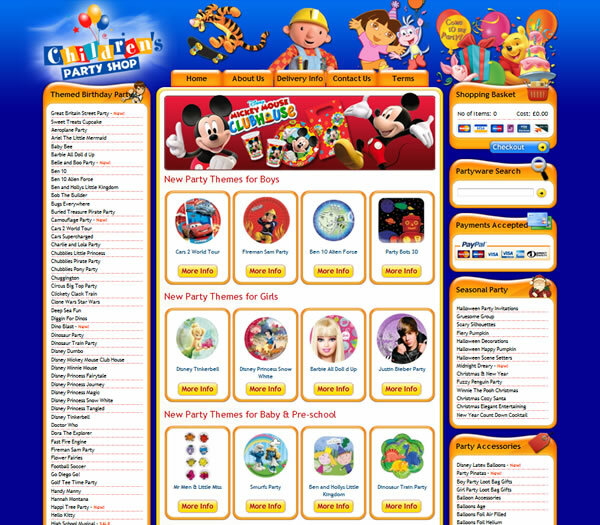 Children's Party Shop came to us in 2008 with an idea. With the help of E2E this idea has developed in to a successful online business which is growing by the day. 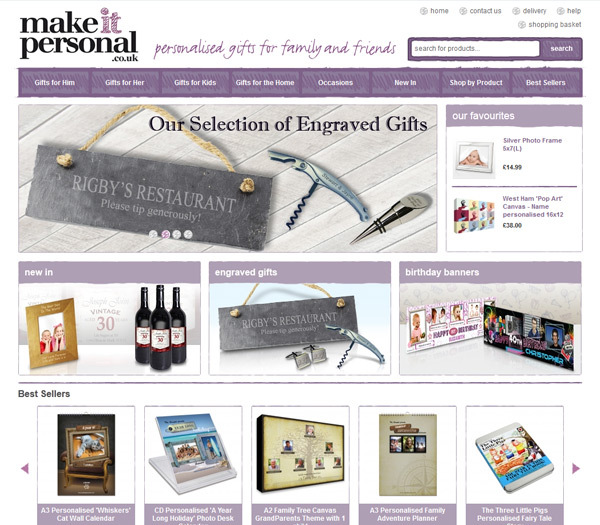 With customers ranging from children to Mums & Dads, we had to get the design and layout just right.